Learn Bridge in 4 days! It is possible you have already thought about learning bridge, but have never got round to it, or perhaps are a little bit rusty and wish to increase your confidence and build on the foundations of what you already know, or maybe you already play bridge and you would like your friends to learn too. 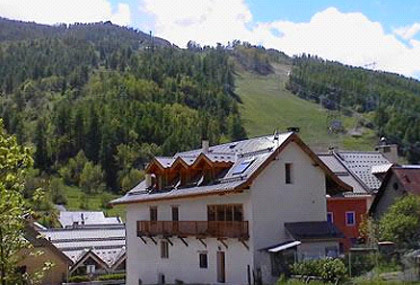 We are offering beginner courses in the charming Chalet Les Marmottes in the French Alpine resort of Serre Chevalier. Next beginner course: Monday June 24th - Friday 28th 2019 Click HERE for details. NB If you are a group of 6 or more, we can organise a date to suit you - contact us for full details. Claudia Stocken has lived in the area for the past 16 years and will ensure the smooth running of your holiday. As an experienced bridge player, she will be sharing the teaching with her mother, Dinah. Dinah Stocken has many years experience of teaching bridge, specialising in beginners. She also lives in France and knows the area very well. Our teaching methods are ideal for those who are starting from scratch and those whose knowledge may be a little bit rusty, patchy or hesitant. Our approach is to take you at a safe and steady pace so that you quickly get the hang of things and become enthusiastic and confident for the next stage. Most importantly it is FUN! Group sizes will be small (between 6 and 16 players for two teachers), enabling you to learn more quickly. Chalet les Marmottes, situated in the centre of the old part of Chantemerle village, is an old French farmhouse, lovingly restored by Denis and Karin Lucas to provide accommodation for up to 16 people. The chalet is typically alpine with exposed beams throughout and the cosy bedrooms all have ensuite facilities. The living room with its log fire is full of character and the separate dining area on the first floor has a large south-facing balcony with fabulous mountain views. There is also a private garden with decked terrace - perfect for well-earned aperitifs after bridge. I enjoyed the holiday more than I could have imagined. Excellent course and practice. Confidence boosting and the perfect platform to get started. I have been left full of enthusiasm to 'get going' when I get home. It's been a truly wonderful experience. The bridge tuition has far exceeded my expectations and the team have been fantastic. The group has got on so well and enhanced by Claudia, Dinah and Karin. I really enjoyed myself at Serre Chevalier and found the bridge lessons very helpful. I am very pleased that I came to Chantemerle to learn in such beautiful and relaxed surroundings. I shall definitely go on another Bridge holiday. I loved my stay at Serre Chevalier particularly the walks with Mike and the very good bridge lessons. 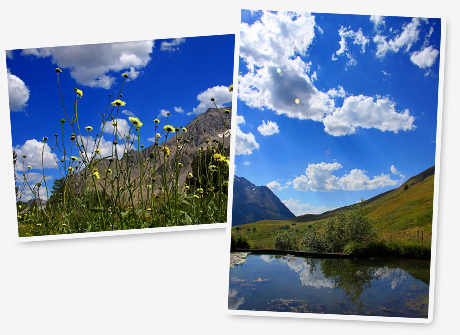 Serre Chevalier is the collective name for several traditional villages in the Guisane valley, stretching from the magnificent 12th century walled town of Briançon to the beathtaking Col du Lautaret with its glacial views. This region has spectacular mountain scenery with a mediterranean climate, and is the sunniest in France, with 300 days of sunshine per year on average. France's best kept secret!